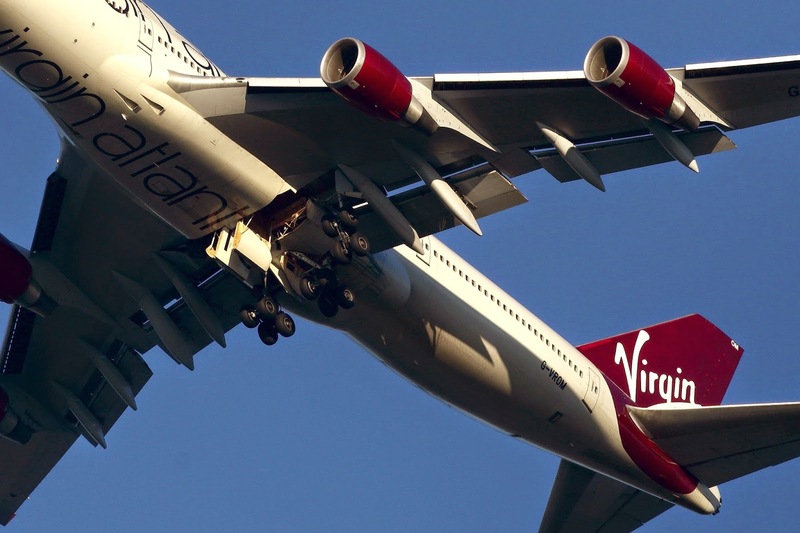 Aviation Updates Philippines - Watch how an amazing pilot of Virgin Atlantic Flight 43 lands the Boeing 747-400 in Gatwick due to malfunctioning right landing gear. Flight 43, which departed from London Gatwick bound for Las Vegas, was currently flying at 32,000 feet west of Gatwick when the crew decided to return to the airport due to hydraulic problems. During approach, the right landing gear of the aircraft did not fully extend. According to a report in the Aviation Herald, the crew went around, worked the related checklists without success, performed a low over pass above Gatwick Airport to have the landing gear inspected from the ground which confirmed the right main gear had not extended. The aircraft was holding in the air to burn fuel. After burning the fuel, the aircraft made its final approach with its right landing gear not extended. The Boeing 747 touched down at the airport's Runway 26L with a slight crosswind as shown on the video. After it landed, emergency vehicles immediately rushed to the aircraft. Mobile stairs and buses were used to transport the passengers from the damaged aircraft. According to a report, the airline is now going to implement a non-standard landing procedure.